You walk in, jump, slide or maybe even just start with the tips of your toes. But you get into the water. The more you retreat into the cool blue, the more you feel a weight lifted off of you. There’s a scientific word for it — the weightlessness you feel in the water. It’s buoyancy. But what it means is that the natural properties counteract the effects of gravity. And it helps support your body. The more you submerge yourself into the water, the more the water is there to support you. Walk in to water that’s waist height, and the water supports 50% of your bodyweight. Chest-deep water reduces the effect of gravity by 70%. And neck deep water? Ninety percent of your bodyweight is supported. So if a 160-pound woman was exercising in a Master Spas Swim Spa, which is about 5 feet deep, she will “weigh” 16 pounds. Big difference, right? But the bigger difference is the way the buoyancy of water, and exercising in a swim spa, makes you feel. Anyone who exercises in the water will realize the benefits but using a Master Spas Swim Spa can be especially good for people trying to lose weight, those with chronic conditions and injured athletes. Exercising in the therapeutic waters of a swim spa from Master Spas can increase range of motion and improve circulation. The buoyancy of water also reduces pressure on joints. Exercise is an important part of weight loss, and many experts suggest that people get up to 60 minutes of exercise most days of the week. But that can be challenging when you are first starting out. It might not just feel difficult — it could be difficult. The buoyancy of the water in a swim spa acts as a cushion, reducing the impact on the joints and makes working out feel better. The increased range of motion afforded by water’s buoyancy will not only help during a workout but after. People report being able to move better during daily activities, improving their quality of life. Someone exercising in a Master Spas Swim Spa will feel more confident and less worried about falling or getting hurt. Plus, exercising in a swim spa makes exercise more convenient and less intimidating. When starting a weight-loss journey, people can feel a sense of fear, worried about being judged or knowing how to use the equipment, when they walk into a gym. 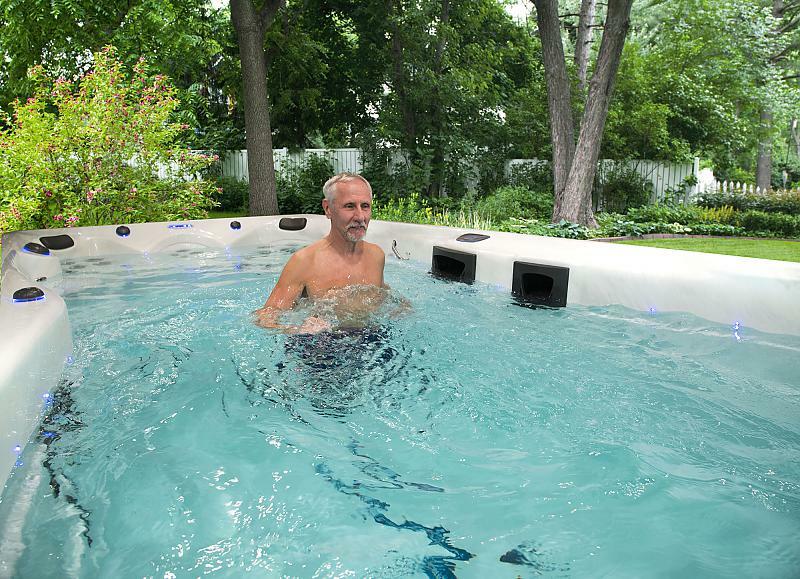 With a Master Spas Swim Spa, new exercisers can turn on a gentle current and walk. Or, they can use the fitness equipment and guides that come with every Master Spas Swim Spa purchase. With illustrations for every exercise, anyone will feel comfortable getting started. Whether you have just had surgery or are recovering from an athletic injury, making a comeback is important. But you want to do it safely so that you don’t compromise your recovery. In a Master Spas Swim Spa, the water bears the weight — not you — and takes the pressure off soft tissue, joints and bones. You will be able to improve your range of motion without feeling the pain that you might on land. Remember, if you are in shoulder deep to neck deep water, your bodyweight is just 10% of what it would be on land. Exercising in the swim spa, under doctor’s care, can help you make a fuller, quicker recovery. After a stroke, patient might experience weakness, partial paralysis and trouble with balance and coordination. All of that can make it difficult for a person to walk “normally” after a stroke. The altered gait can not only affect muscle strength and flexibility but increase the risk of injury. The water’s buoyancy makes it easier for a stroke patient to stand, even if he can’t do so on land. It makes moving easier with less effort. Research has shown that aquatic therapy can help stroke patients improve balance, coordination and flexibility while making it easier to stretch. Many exercise recommendations for people with osteoporosis or bone loss involve weight-bearing activities. The impact helps to stimulate bone growth, or at least help avoid bone loss. But aquatic exercise can help people with osteoporosis with balance and general movement, especially in high-risk populations. According to research, working out in the water can decrease the risk of falls and the potential for hip fractures. A Master Spas Swim Spa can also be warmed to a temperature so that users can also realize the therapy benefits of warm water. Most people will experience low back pain at some point during their lives. But for some people, the pain is much more than annoyance. It can be a chronic condition that’s debilitating. Doctors might recommend exercise to help relieve the discomfort but a studies show that working out in a swim spa could be quite beneficial. The buoyancy of the water reduces the feeling of pain, allowing people to get in a quality workout that might not be possible on land. A Master Spas Swim Spa is also an ideal environment to improve core strength, which has been shown to alleviate some low back pain. Interested in how a Master Spas Swim Spa can help you? Contact your local dealer.